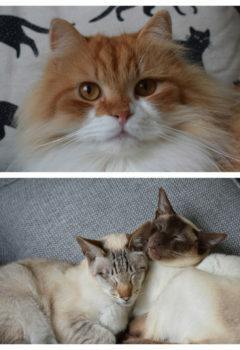 Instagram cat purrsonalities Pickles, Noodles, and Buddha live in the Netherlands and use their platform to show the world the importance of fostering cats for animals shelters. Their human guardian, Brechje, is a pet adoption advocate for cats, many of whom she fosters in her own home. When not posing for the camera, Pickles, Noodles, and Buddha are the official “welcoming committee” for all the fosters who look to them for guidance.